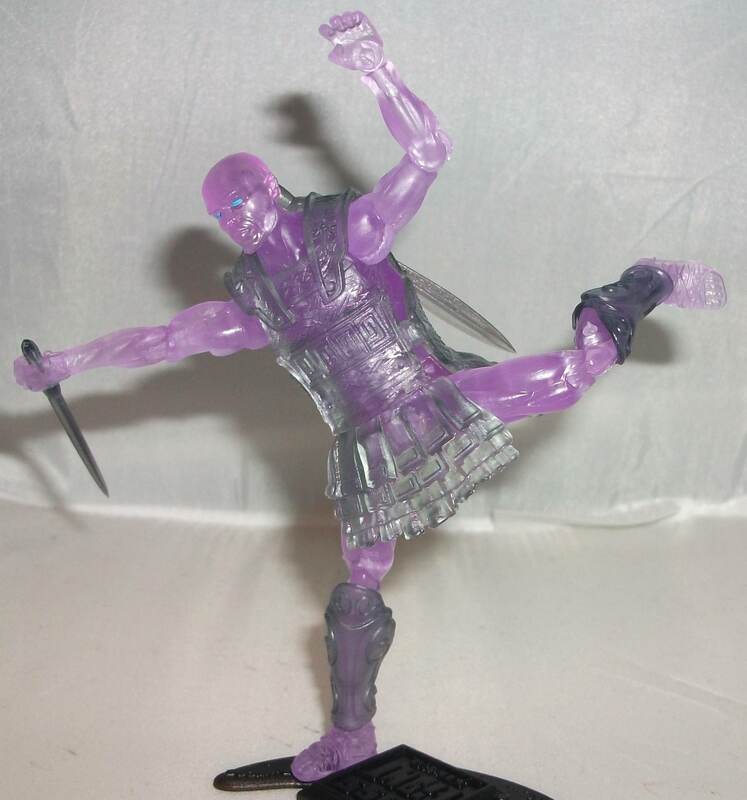 I’ve reviewed a handful of Vitruvian Hacks figures now but I’ve only just scratched the surface of their awesomeness. I still have so many cool Spartans and Gorgons to share with you but today I’m going to take a look at a a completely clean slate. 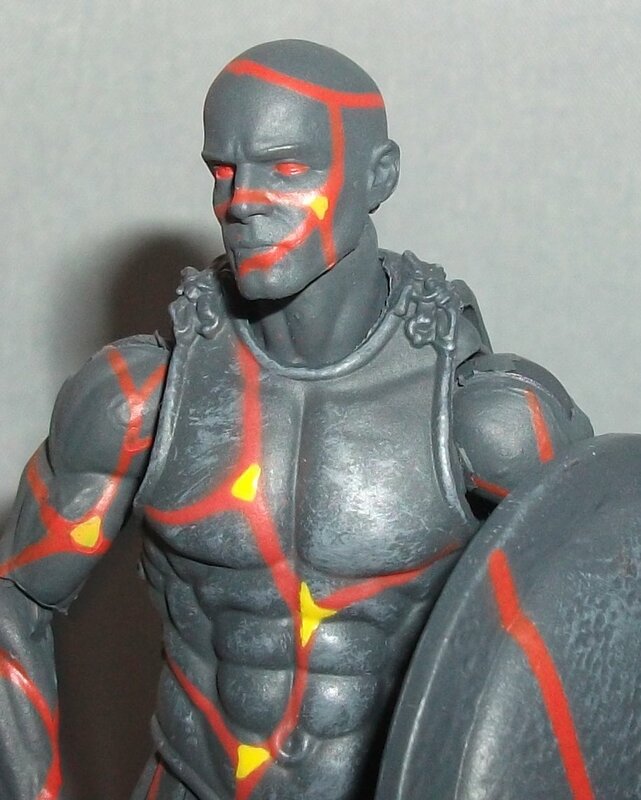 One of the main ideas behind the Vitruvian Hacks line is customization. H.A.C.K.S. 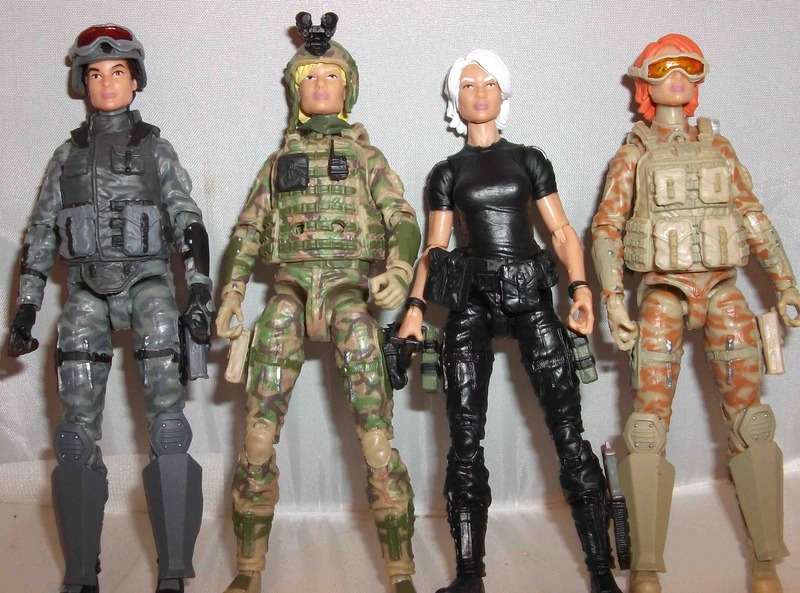 is an acronym for Highly Articulated Character Kit System. Boss Fight Studio, the creators of the line, want you to swap out pieces and mix and match weapons to create your own original characters. 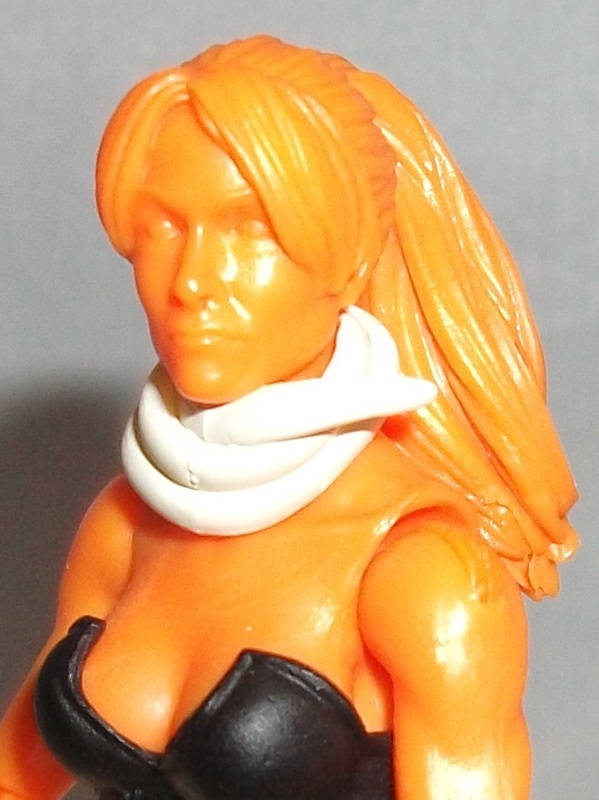 To help customizers do just that, BFS has produced blank male and female figures in a variety of colors. The blanks have no painted details and no accessories. Each one comes in a baggie with four alternate heads (bald, short hair, long hair, masked), three pairs of feet (bare, sandals, boots), and two sets of hands. These options allows for all kinds of build possibilities. 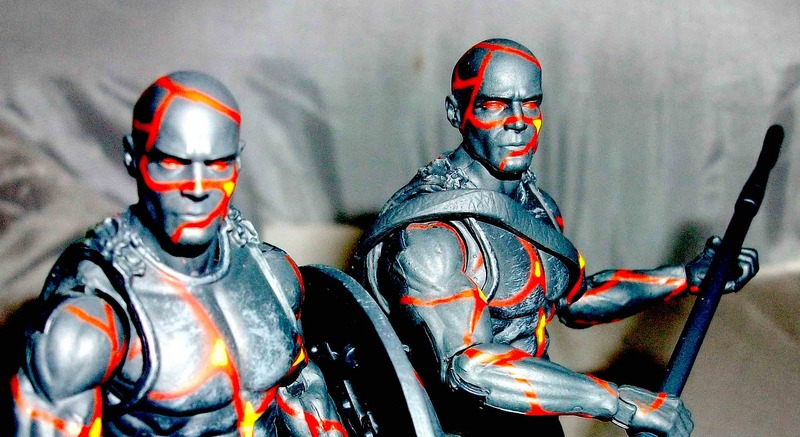 The blanks feature the same beautiful sculpting and the same amount of articulation as the standard V-Hacks figures. If you think you might be interested in doing some customizing of your own the blanks are available at BFS’s web store at a very reasonable price and they’re constantly adding new colour variations. Since I backed BFS’s kickstarter campaign with an “all-in” contribution I received one blank in every color they had available at the time which was 16 (8 male and 8 female). I also received a bunch of extra accessory packs that contained tunics, helmets, and weapons so I was able to dress/arm all my blanks in some manner of outfit. So, rather than just review a completely blank figure, I’ve decided to review one of my original creations. My mom has told me on more than one occasion that I remind her of the 40-year old virgin but for the record I am not in the habit of sitting at home painting my action figures (plus I’m only 38 and I have a girlfriend). True customizers might scoff at my so-called creation because I built her with minimal effort and no paint but she is a Mike’s Collection original none-the-less. 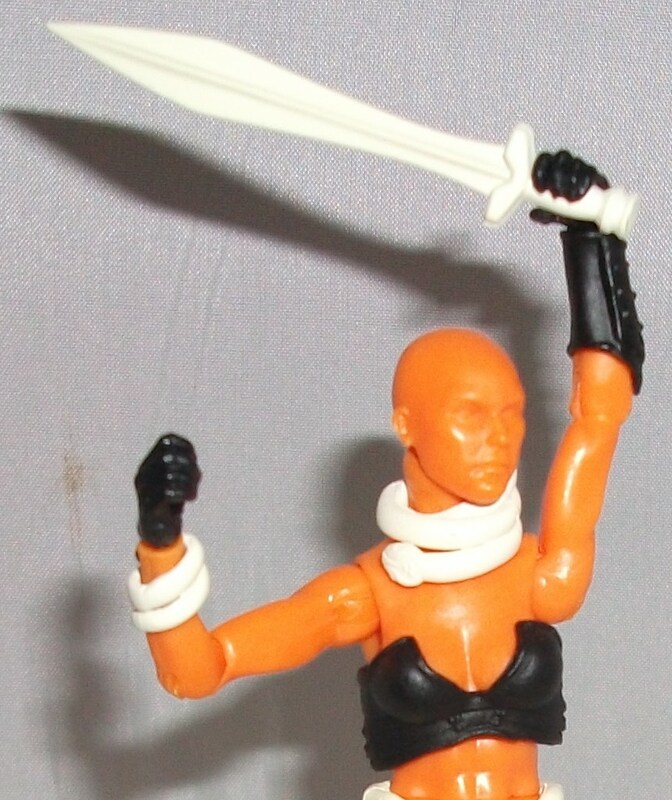 All I’ve done is taken the orange female blank, given her some white and black accessories, and named her. She’s actually one of my least accessorized blanks but for some reason she’s become my favorite. I suppose the orange skin is the main reason for that. The pink and purple skins are too girly and the “walnut brown” and “champaign beige” skin are too close to actual flesh tones that they look strange with unpainted eyes. 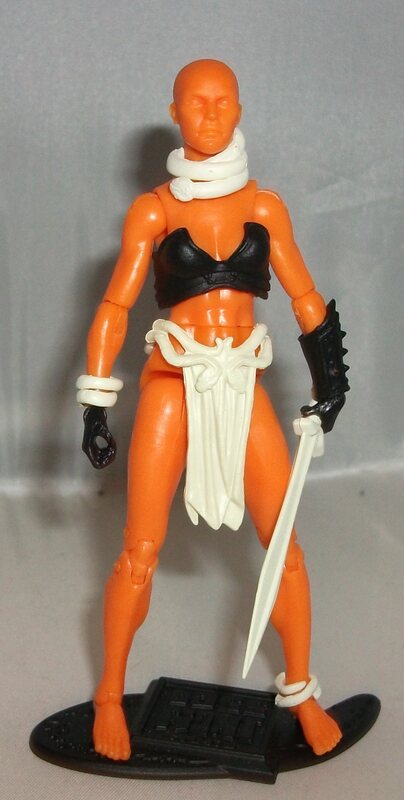 The unpainted facial features on the orange head don’t bother me because I see her more as a mythic elemental rather than an actual person. I’ve named my elemental Citrina because of her citrusy skin tone. I’m thinking she was created by Zeus or some other conniving god for a reason not yet known. I see her as an ally to the Spartans in their war agains the gorgons. She wears mummified snakes around her neck, wrist and ankle as a means to protect her from Medusa’s cursed stare and she wields a sword carved from the tooth of the Kraken which repels all manner of beast. I’m literally making this up as I type it so forgive me if it’s silly. I think these blanks are great and even though I have no customizing skills I find myself wanting to purchase each new color variation. It’s hard to know how to score these figures but between the quality, the concept, and my added bit of flair I’ll give Citrina an 8 out of 10. 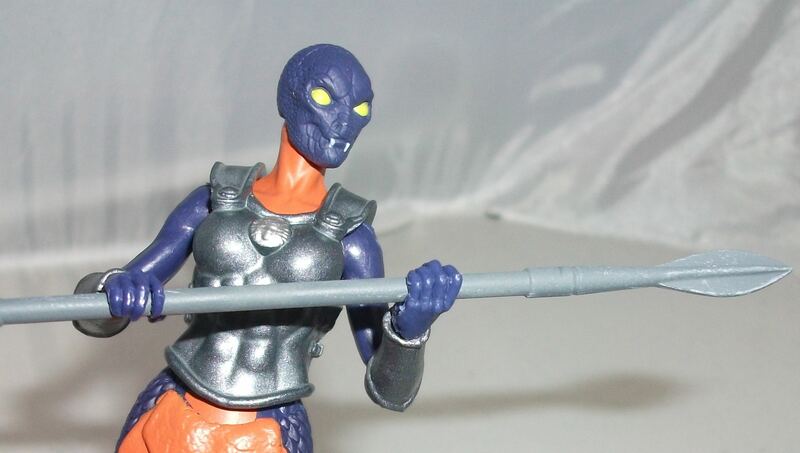 I hope you don’t mind but I’m going to review yet another Vitruvian Hacks figure today. I usually try to keep my posts relatively diverse but the novelty of these figures hasn’t worn off yet and I just want to keep talking about them. Today I’m going to take a look at Stonefist. This is easily one of the coolest figures in the line. I’ve already praised the Undead Warrior and the Underworld Warrior so it shouldn’t come as a surprise that I love this figure too. 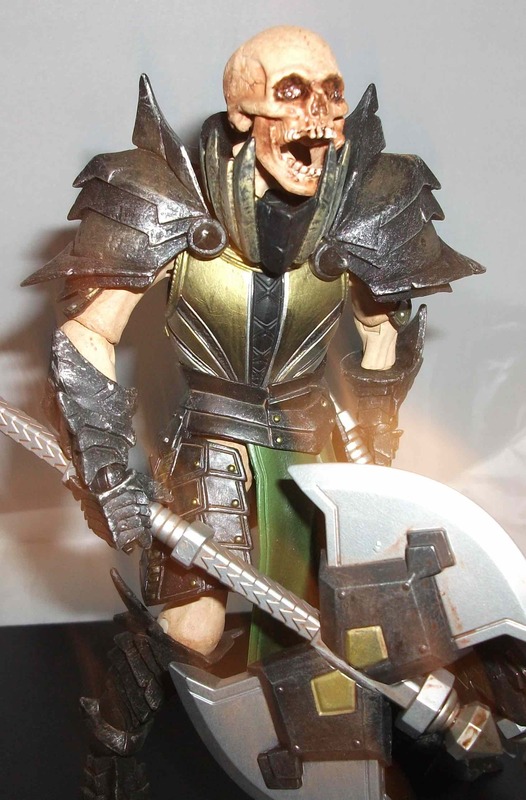 The build of this figure is identical to those two and his outfit is the same as that of the Undead Warrior. 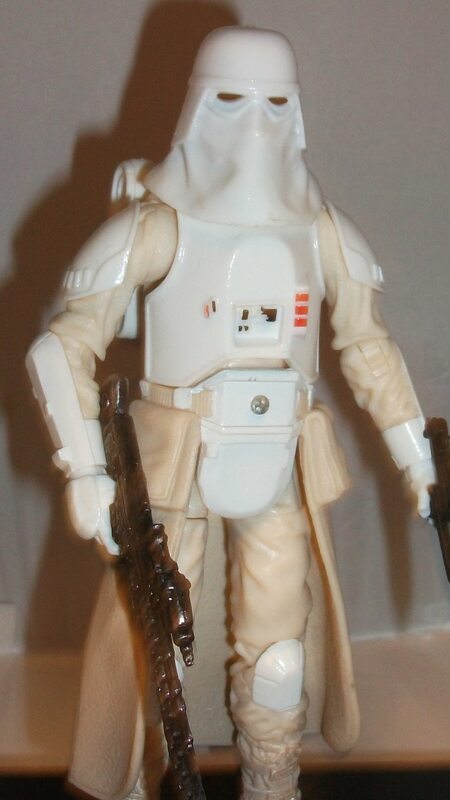 What makes this figure stand out from the pack is the paintwork. 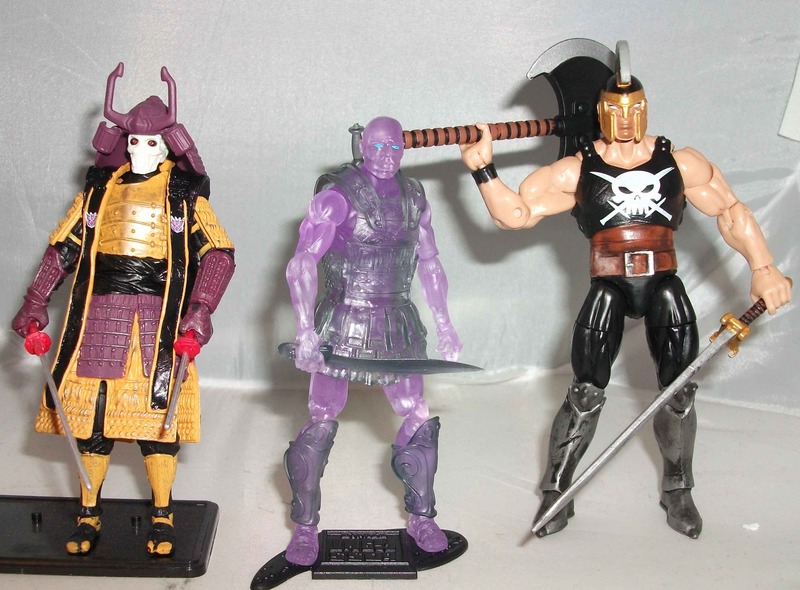 The other warrior figures were great but lacking in the paint department, which was fine given their story lines, but Stonefist ups the ante big time when it comes to paint applications. Finally I can show you the full extent of Boss Fight Studio’s (BFS) brilliance. If you’re not up to date on your Greek mythology, or if you haven’t seen Clash of the Titans, here’s a little recap on Medusa. She’s a cursed Gorgon and anyone who looks her in the eyes is turned to stone. I was always under the impression that those stone warriors were dead but, according to the bios provided by BFS on the card backs, those stone warriors remain alive. They’re cursed to remain completely conscious of the world around them with senses heightened to god-like levels so they can see and hear for miles around them. BFS gives a ray of hope to the cursed though by adding that they can revert back to their human forms if the gorgon who turned them is slain. I don’t know if any of that comes from Greek myth or is BFS just made it up but it’s all pretty cool regardless. According to Stonefist’s bio he was an Athenian Warrior who, in the midst of being turned to stone, blinded himself in hopes that it would put a halt to the curse. The end result was a blind dude with enhanced senses and an unbreakable stone fist. How cool is that? I don’t know if blinding yourself to stop the curse makes much sense but it’s a neat idea and this is all fantasy so who really cares. 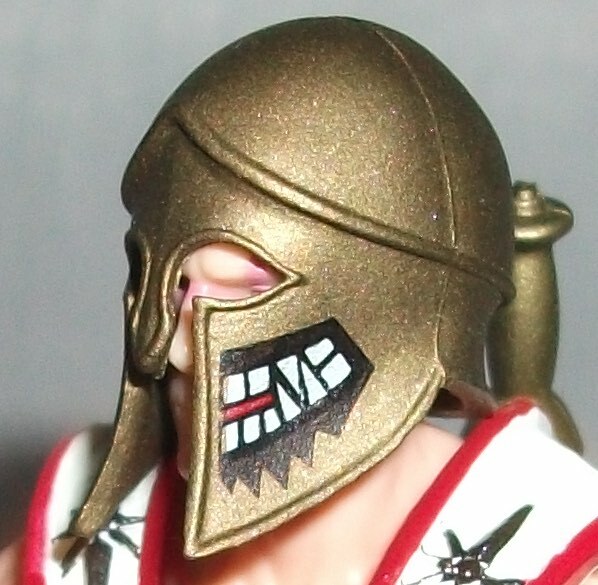 One of the other figures in the V-Hacks line is a generic Athenian Warrior. 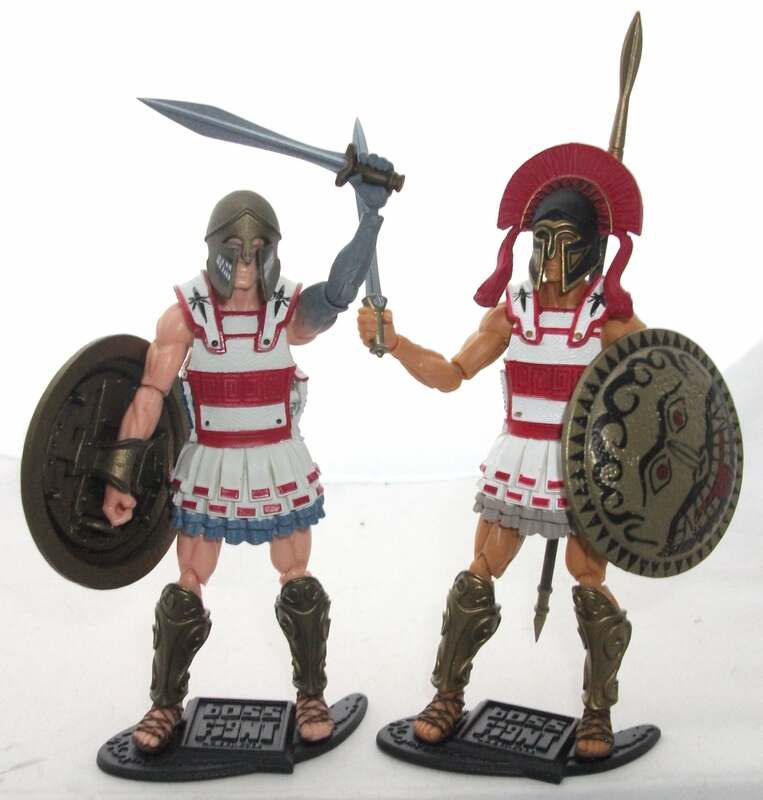 As was the case with the other warrior figures, Stonefist and the Athenian are the exact same figure construction wise; they share all of the same parts. They even have the same tunic but there are a few paint variations to differentiate the two. 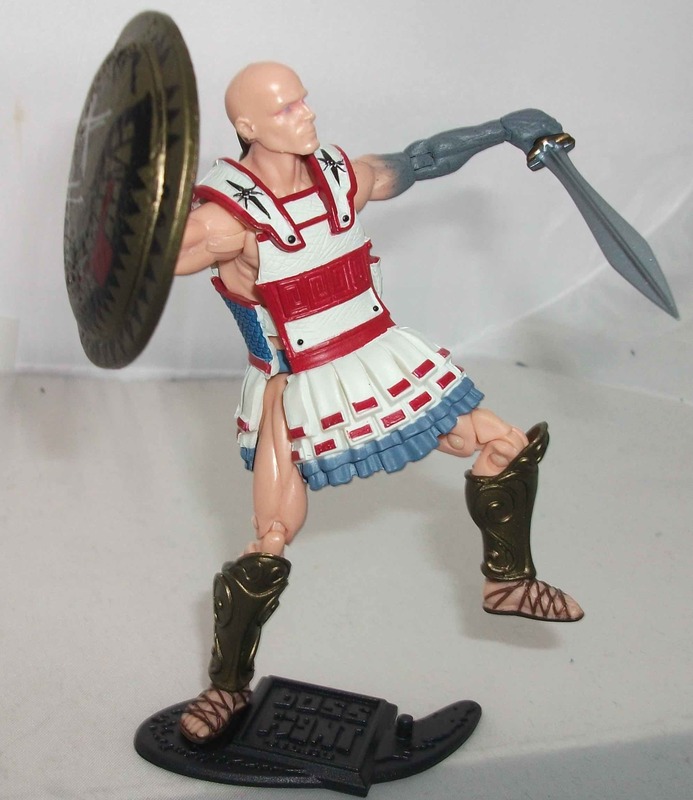 Stonefist has blue trim on his skirt whereas the Warrior has tan. Also, Stonefist has blue chainmail on his sides and black button adornments while the Warrior has gold. The multiple paint apps on the crisp white tunics of these Athenian soldiers make them the most regal looking V-Hacks in the line. The biggest paint variation between the two is Stonefist’s left arm is painted grey to resemble stone. The stone arm looks pretty believable. I like the way the speckled paint softly fades into his flesh shoulder. Another cool difference between the two Athenian figures is their skin tones. The warrior is cast in a healthy bronzed flesh tone while Stonefist shares my pasty sickly complexion. 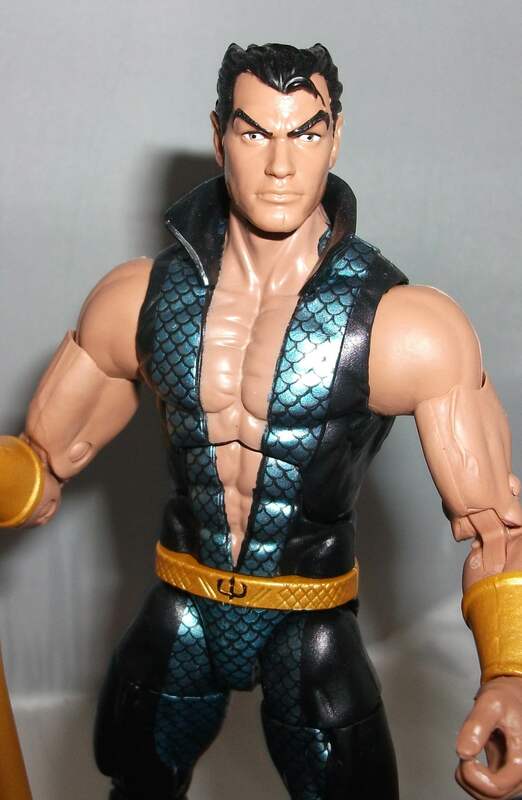 At first I thought Stonefist had a unique head sculpt. 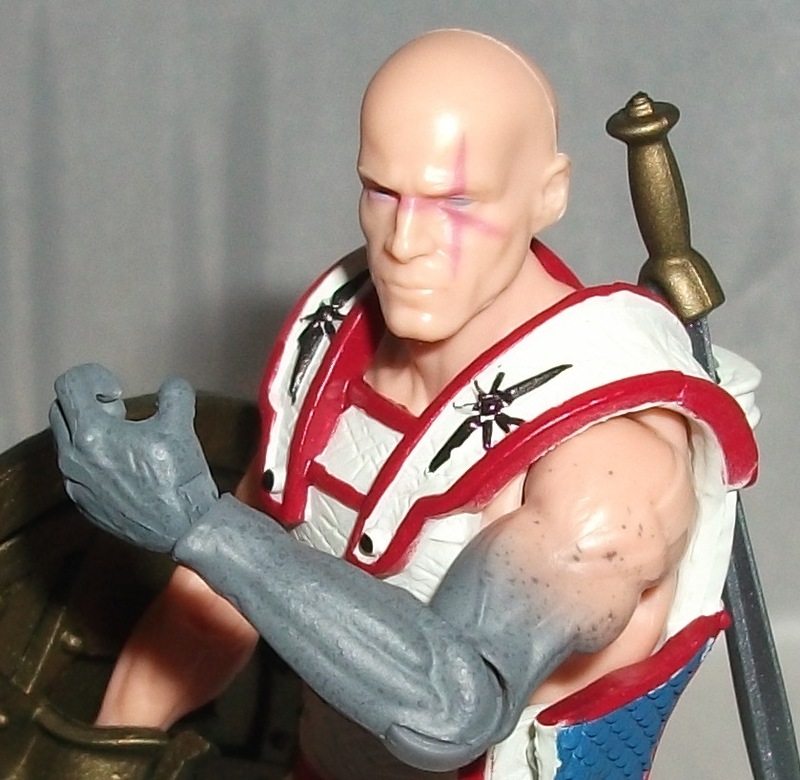 Upon closer inspection I realized it’s the standard bald head seen on multiple V-Hack figures. 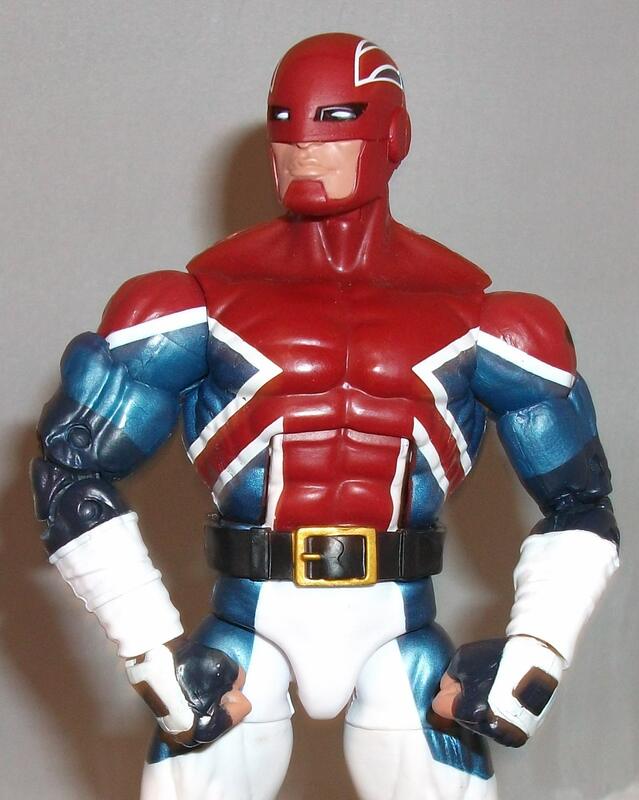 It seems like a different head though because, again, the paint job is fantastic. 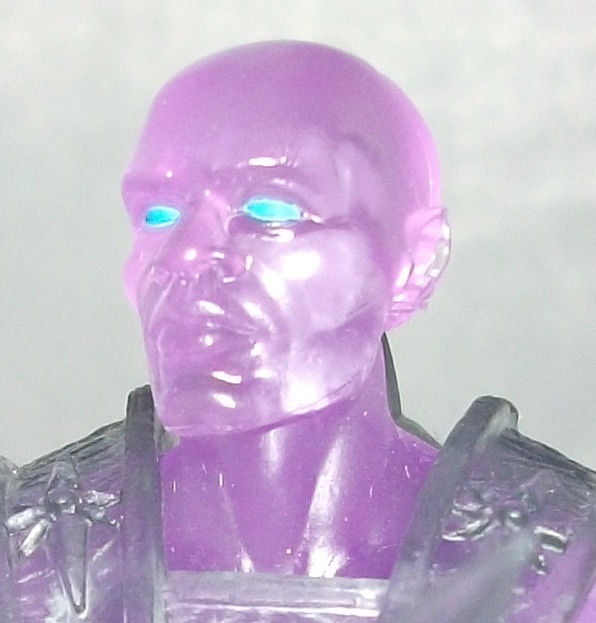 Stonefist’s pupils are painted a foggy blue and there’s a pink scar across them to show where he blinded himself to stave off the transformation. BFS could have went gory with this effect but I’m glad they didn’t. The subtle paint job tells the story just fine. The last thing we have to talk about are Stonefist’s accessories. 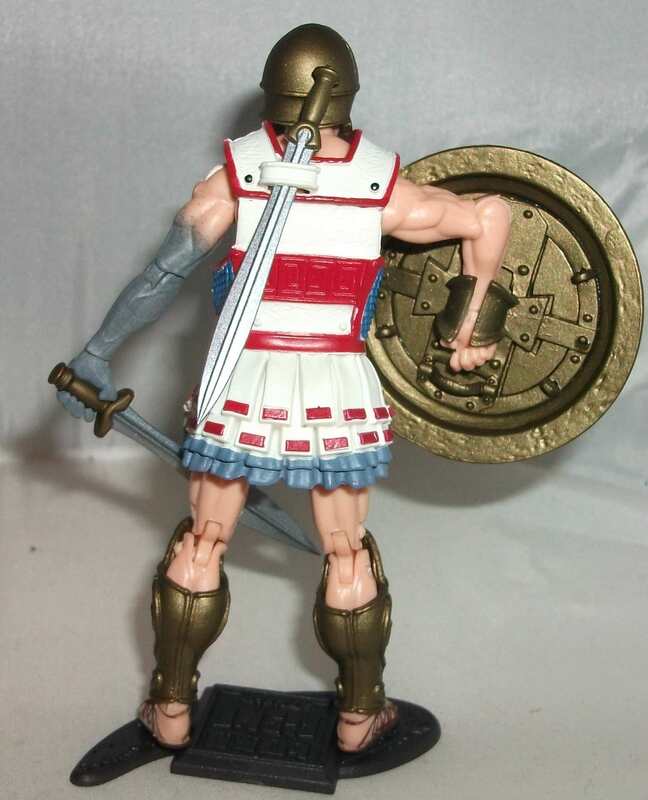 He comes with a bunch of the same stuff we’ve seen with the other figures: 3 swords, a spear, an over the shoulder sheath, leg armour, a tunic, spare hands, a helmet, a display base, and a shield. They’re all great little pieces but there isn’t much to be said about them that hasn’t been said already as far as the sculpting goes. But once again some simple paint apps manage to impress. His helmet has a toothy sneer painted on each side which looks really cool and tells you that this guys is a total badass. Also, he has the same face deco on his shield as the Athenian Warrior but the eyes on Stonefist’s shield are X’ed out to symbolize his own blinding. It’s a small detail but it tells a story and I love it. The scratches even look authentic. 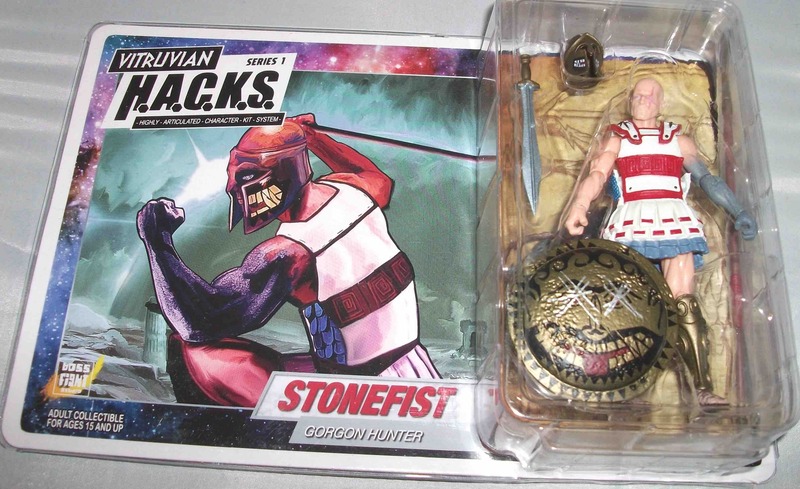 If you’re going to buy just one Vitruvian Hacks figure I think it should be Stonefist. 10 out of 10. The battle between the gorgons and mankind was brutal and, in some cases, eternal. Some mighty warriors on both sides refused to pass on to the underworld and remained trapped in ghostly form. Their sworn oaths keep them locked in an eternal battle until victory is achieved. 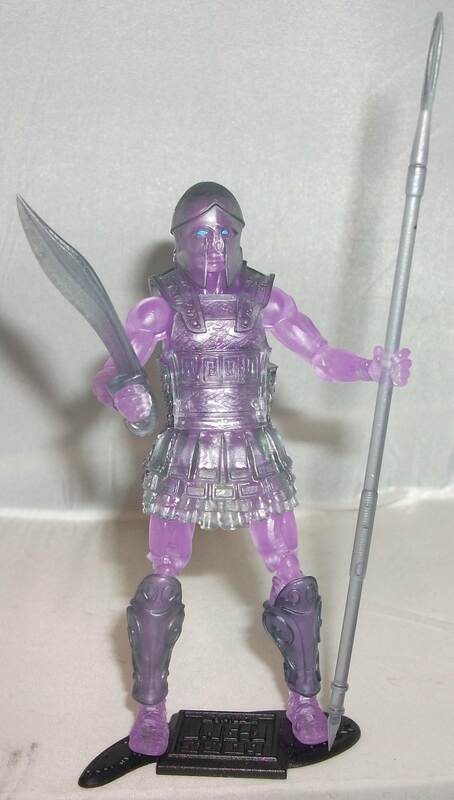 This figure was included in a 2-pack titled “Ghosts of the Battlefield” along with an Afterlife Spartan. Both figures glow in the dark. Since they’re supposed to be ghosts it’s a neat gimmick that makes sense for the characters. If I were a kid I’d probably appreciate the glow in the dark feature a lot more. I’d orchestrate situations to make use of it when playing, like building a cave out of pillows or just flicking the lights off to turn day into night. But as an adult collector I have little use for it. I don’t spend much time in my mancave gazing at my toy collection in the dark. Glow in the dark plastic has a very artificial look to it so it doesn’t easily pass for other materials like metal of cloth. I don’t mind it in small doses, like glow in the dark weapons or maybe glow in the dark armor, but this figure is glow in the dark from head to toe and it’s a bit much. It does look cool when glowing but in the light of day it doesn’t make for a very visually appealing figure. Her skin is the color of a used glow stick and her translucent blue armor is dull and muted. Some paint apps on the armor would have really helped to make this figure more interesting but the only apps are few dabs of black for her eyes and mouth and a pair of white fangs. 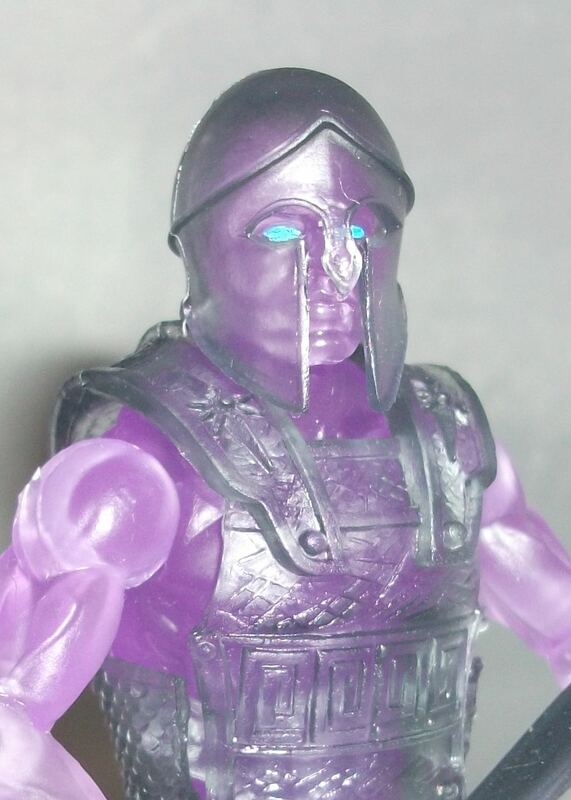 In the case of the Afterlife Spartan, the bland glow in the dark plastic is the only problem; otherwise it’s a quality figure. The same cannot be said for the Afterlife Gorgon. This is the only V-Hacks figure I received where quality control is an issue. 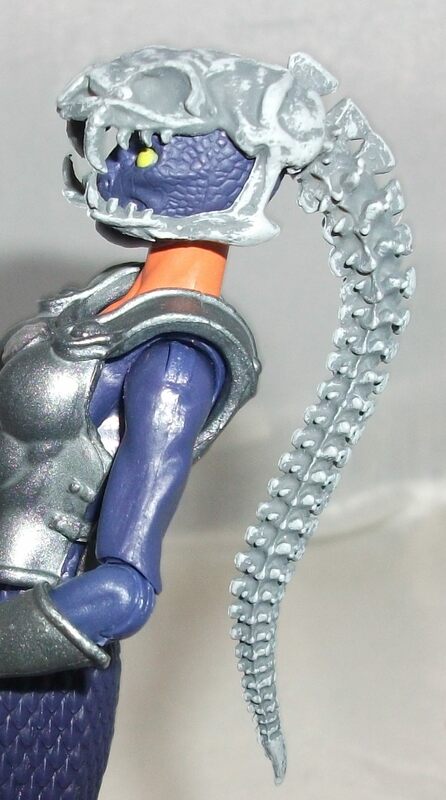 I don’t know if others will have the same issue with this figure as I do, maybe it’s just mine, but her upper and lower torso don’t lock into place. I’m wondering if it has anything to do with the glow in the dark plastic they used, maybe it’s softer or something. The result is limited playability and posability. I have to display her in a rigid upright stance otherwise she crumbles in half. I have no doubt that Boss Fight Studios would send me a replacement if i asked them to but since it’s my least favorite figure of the bunch I’m not too concerned about it. Another thing I don’t really like about this figure is the construction. There are both human and gorgon females in the line and they both look great. This figure is the only hybrid of the two. 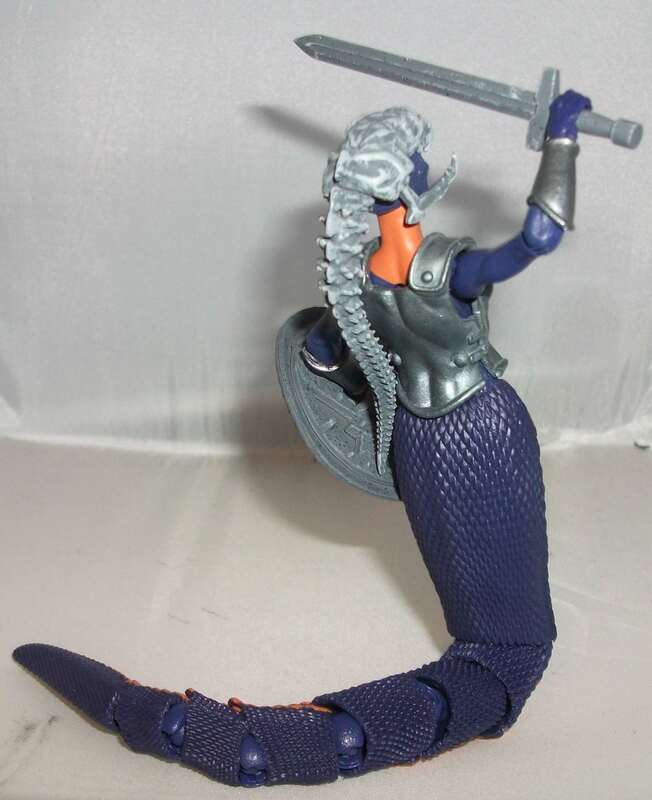 Afterlife Gorgon has a snakey upper half complete with a hissing gorgon face but her lower half is human with legs instead of a tail. The combo is a little bizarre. 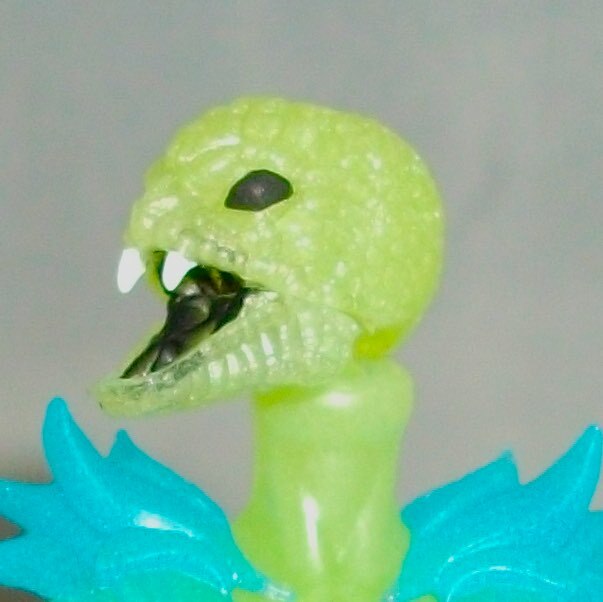 I think a glow in the dark gorgon with a full tail would’ve been much cooler and I’m curious as to why Boss Fight Studio didn’t go that route. This figure is the odd man out when displayed with the gorgon horde so I’m not sure where to put her in my V-Hacks display. The last thing that bothers me about this figure is her outfit. She has the same belt piece as the eldest gorgon sister, Stheno, which has a full skirt in the back but nothing in the front. It looks fine on Stheno because she has shorts painted onto the figure. This figure doesn’t have painted shorts so it looks like she’s Donald Ducking it which is kinda disturbing. A ghost snake woman should have the decency to cover up her lady parts when locked in eternal battle. 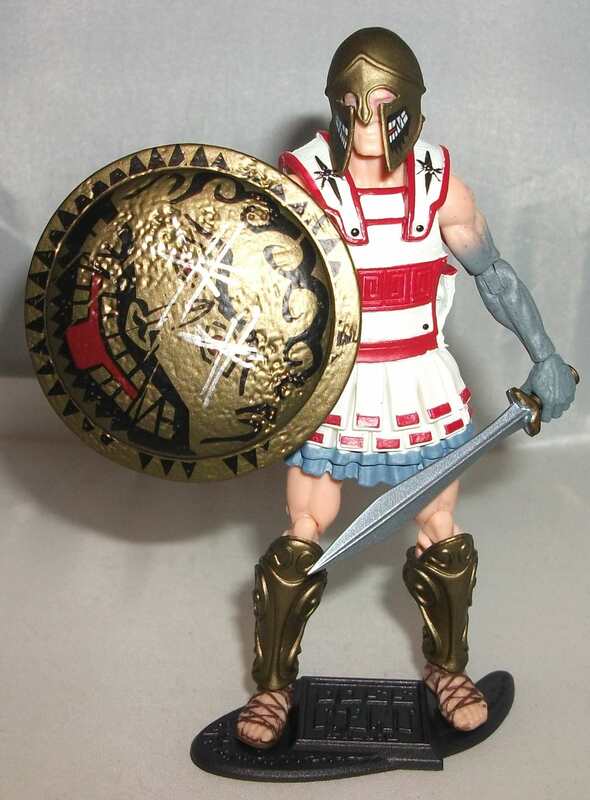 For accessories Afterlife Gorgon comes with the skirt belt, chest armor, shin guards, wrist guards, a sword, a spear, and a shield. It’s a good selection though I don’t love the translucent blue plastic the weapons were cast in. They’re more vibrant than the armor pieces but they remind me of the Day-Glo G.I. 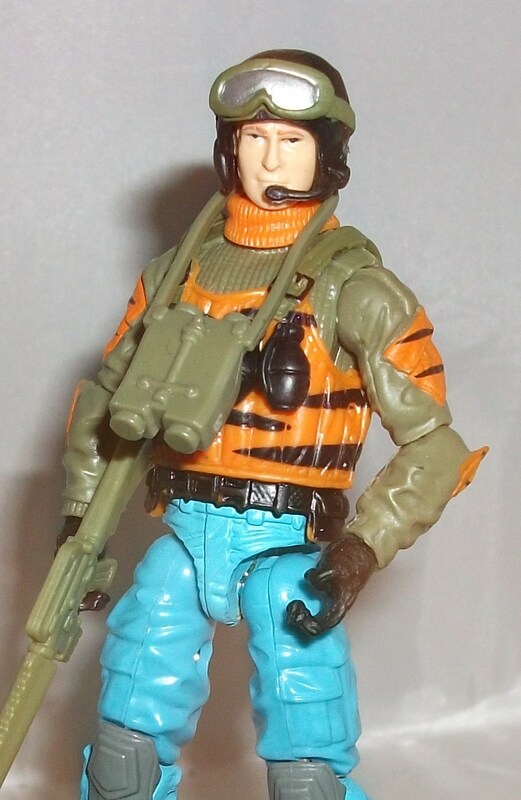 Joe weapons of the 90s and they add to the overall synthetic look of this figure. 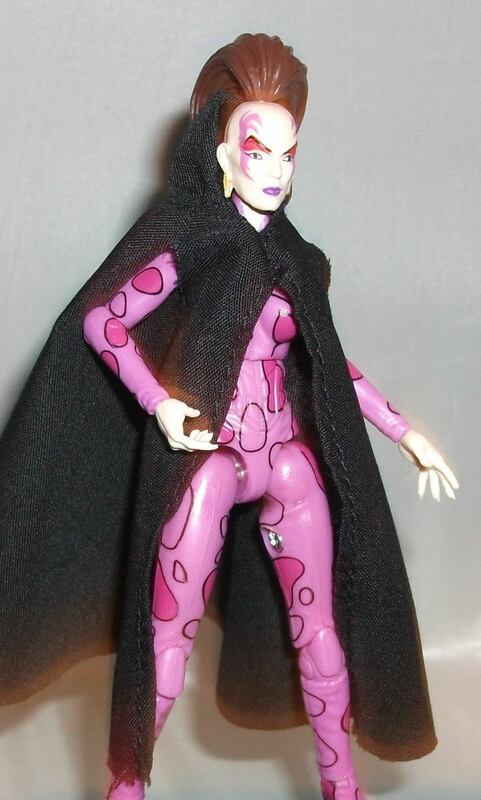 Multiple issues drag this figure down but it is an anomaly of the toyline. 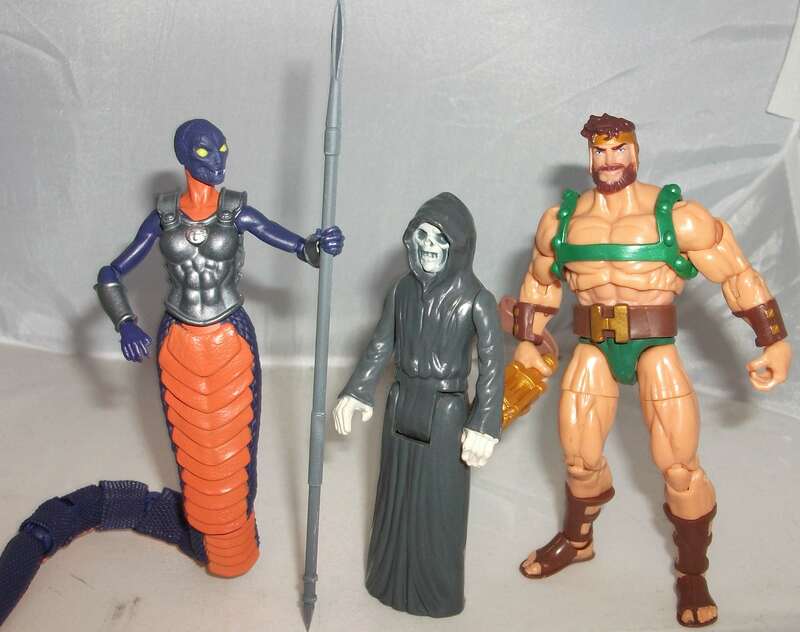 I would say all the other V-Hacks figures are a 9 or a 10 but I’m afraid I must give Afterlife Gorgon a lousy 5 out of 10. On Wednesday my “all-in” shipment arrived from Boss Fight Studios. I had contributed to their Kickstarter campaign two years ago so it was a long time coming. For more information on Boss Fight and their Kickstarter check out this post. 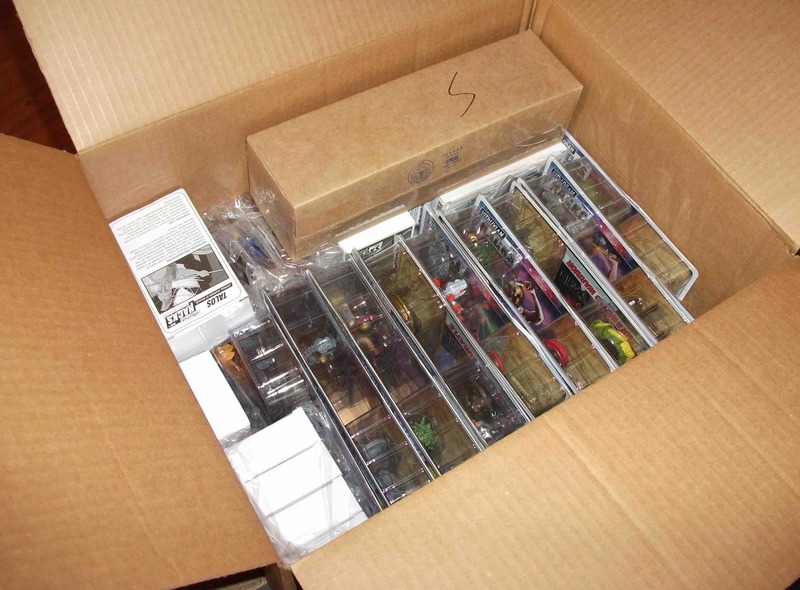 My all-in shipment consisted of 45 figures and 7 accessory packs plus a T-Shirt and a lithograph. It was an epic haul to be sure but the box wasn’t as enormous as I was expecting. BFS did an excellent job of packing everything economically and secure. 17 of the figures came on individual blister cards with colorful original artwork like you’d expect to find in a retail store. 7 of them came in small white boxes with black and white artwork, and the rest came in baggies. Each of the accessory packs came in white boxes as well. The unboxing seemed to go on forever as I pulled out each item and laid them on the floor. 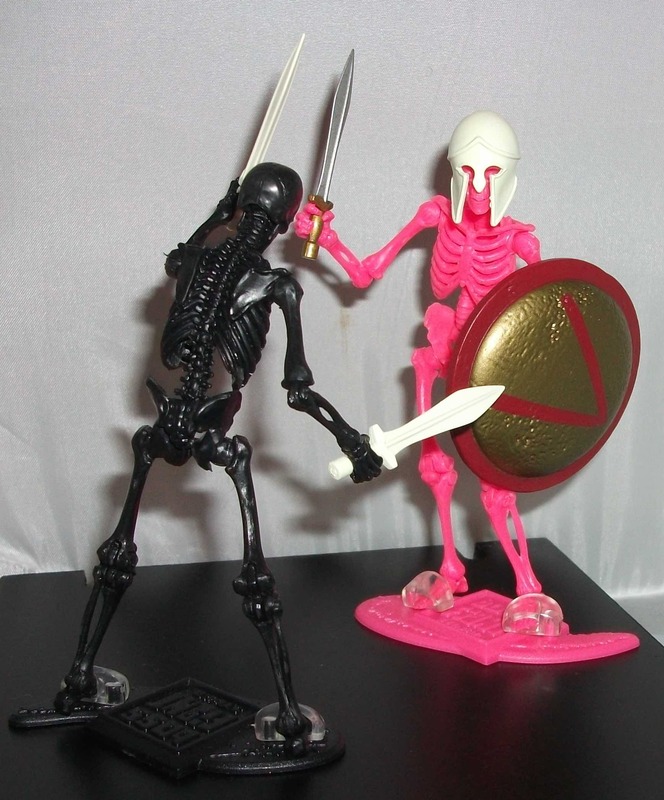 The figures basically fall into the following categories: human warriors, gorgon soldiers, skeletons, and blanks. The humans and the gorgons are all awesome. The sculpting, the paint work, the articulation, and the accessories are all spot-on. 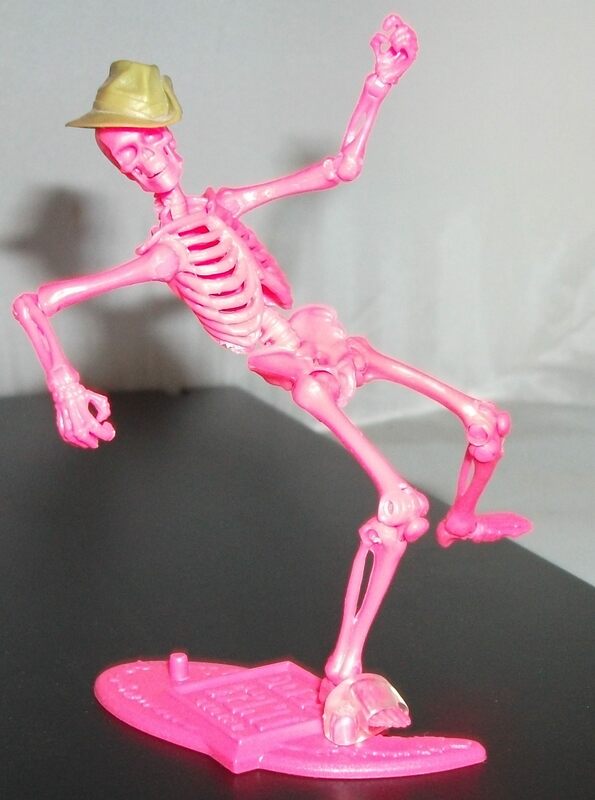 The skeletons are intricately sculpted but due to a lack of paint they’re less exciting to look at. The gorgon sisters and their army have waged war on both man and the gods. Even the lord of the underworld, Hades himself must prepare for their onslaught. Needing to produce an army that was capable of winning this hopeless battle, he turns to their stone victims and infuses them with mystical fire to animate a molten army of burning warriors. These warriors were neither alive nor dead but rather some state in between. When the Kickstarter was still up and running and I was deciding how much to contribute I considered army building the Underworld Warrior. 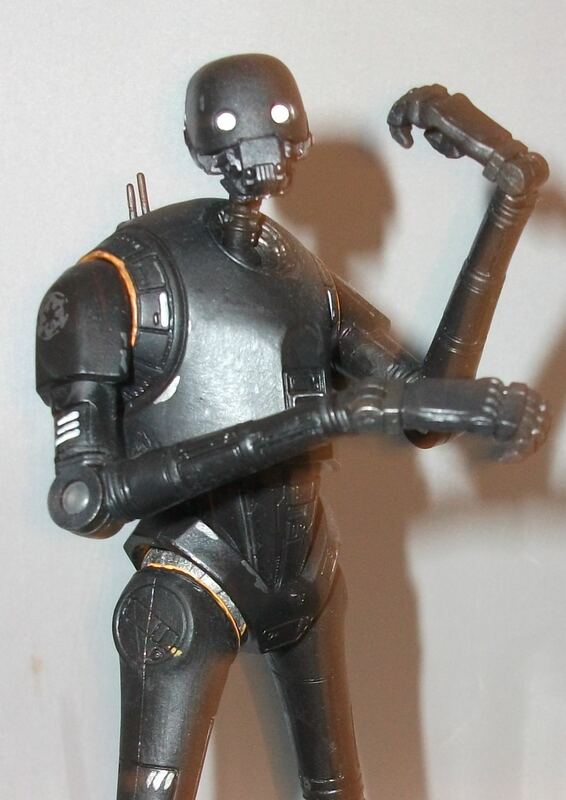 I absolutely loved the idea behind them and the concept drawing of the at-the-time unproduced figure looked amazing. I envisioned a whole shelf full of them. 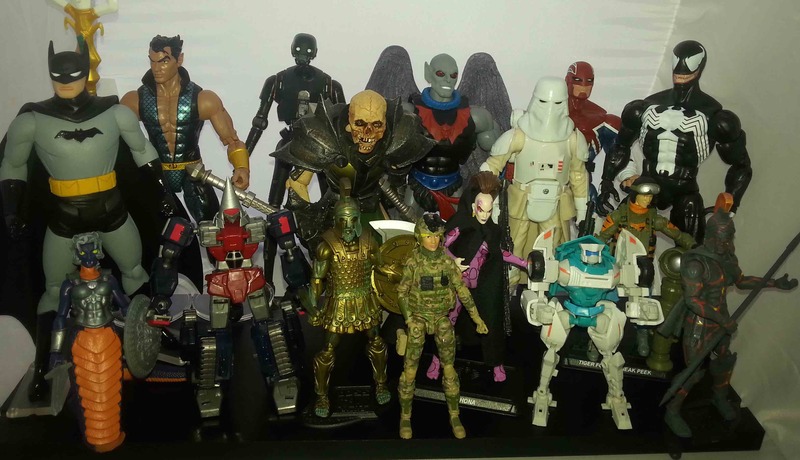 However, the assortment of available figures continued to grow as more people contributed and I wanted them all. It quickly became apparent that collecting just the unique figures was going to be expensive so any dreams of army building were dashed. However, when BFS contacted me a short time ago and offered an additional free figure of my choice to make up for the delays in production I knew exactly who I wanted. 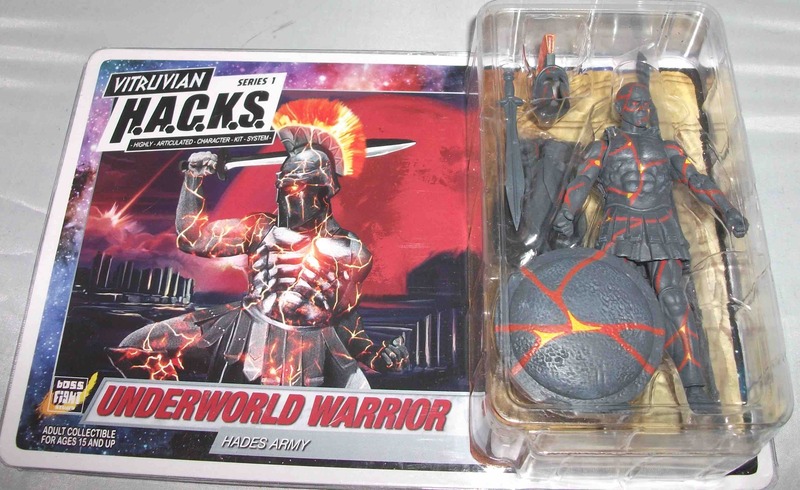 It’s awfully hard to pick a favorite Vitruvian Hacks figure but the Underworld Warrior is a definite contender for me. Once in hand, the figure met all my lofty expectations. Some might say that he’s not as interesting as more elaborate figures like Medusa or Leonidas but I think the simplicity adds to his appeal. When stripped of his gear the Underworld Warrior isn’t much different than the blanks. He’s bald and has no defining sculpted details. All of his uniqueness is achieved with paint applications. His base color is a dark ashy gray and he has orange and yellow lines painted throughout representing the mystical fire. It looks like lava creeping through the cracks of a volcanic rock. I’m really impressed by how cool it looks. That same color palate and design is carried over onto his tunic, helmet, and shield. 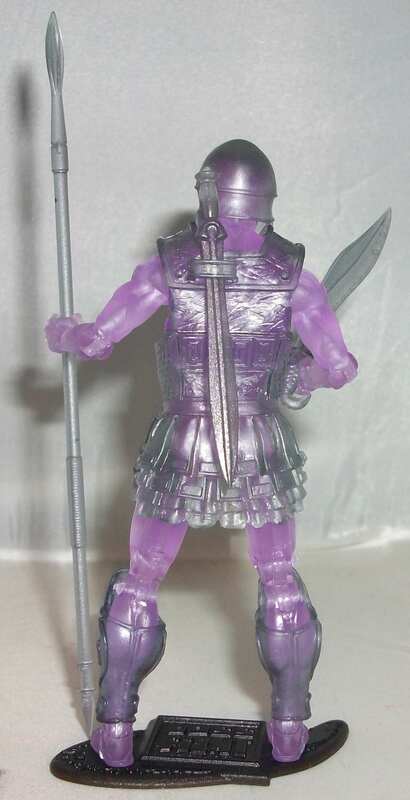 For accessories the Underworld Warrior came packaged with the aforementioned tunic, helmet, and shield as well as two swords, a sheath, a spear, spare hands, and a BFS display base. Each weapon is nicely sculpted and fits snugly into his malleable plastic hands. Since he shares the same build as the Undead Warrior I reviewed previously I don’t have a whole lot more to say about the articulation but I’ll sum it up by saying he has the best articulation of any figure at this scale ever. I highly recommend you visit BFS’s webstore and order yourself some of these bad boys asap. 10 out of 10. The Ringneck Gorgons were quiet and smart. Their tactical knowledge and efficiency were their most deadly asset, assessing the situation and deciding how best to win a fight within seconds. Their decicions were deadly and final, usually leaving an enemy eviscerated or worse. Regular readers of this blog know I love G.I. Joe, Transformers, Marvel Super Heroes, and Star Wars; all brands that I grew up watching on TV and reading in comic books. 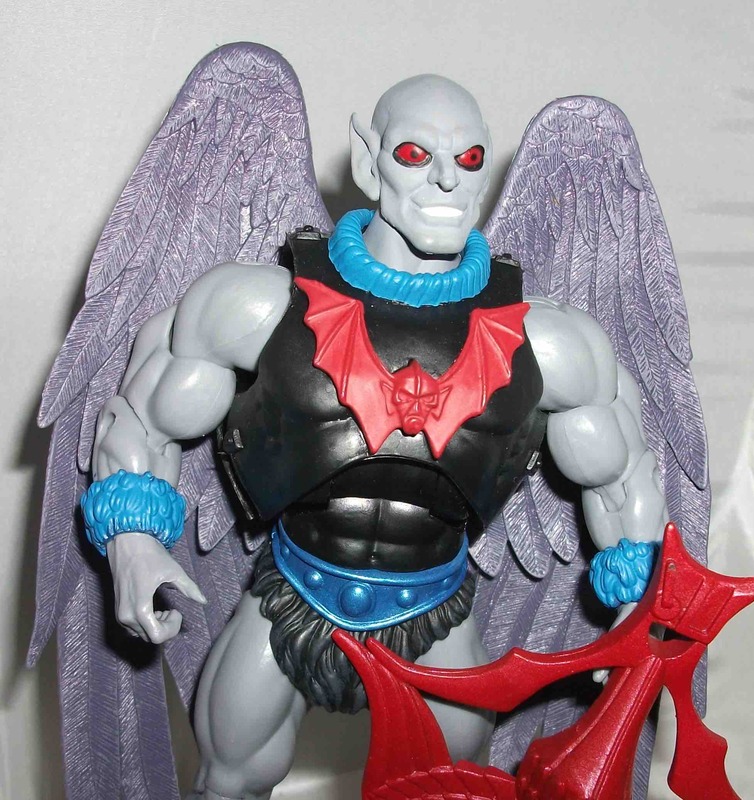 Boss Fight Studio’s (BFS) Vitruvian Hack’s toyline is an original concept with no media tie-ins so you might be wondering why I’m so excited about them. The simple answer is Clash of the Titans. And no, I’m not talking about the Sam Worthington movie from 2010 (though I like that one too). I’m talking about the 1981 film starring Harry Hamlin as the demigod son of Zeus. I first saw it when I was really young (I would’ve been 3 when it came out) and I was absolutely captivated by it. 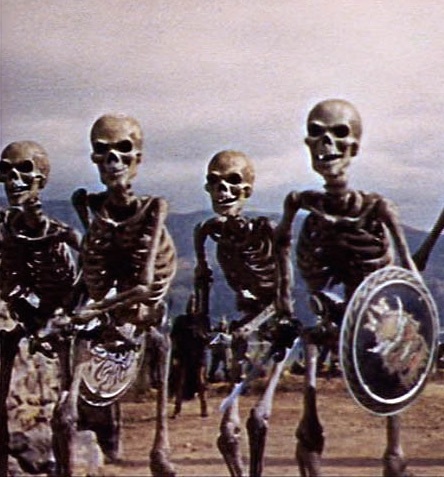 All of the mythological creatures were animated in stop-motion by the legendary Ray Harryhausen. In the climax of the movie (spoiler alert!) the Kraken emerges from the deep to accept Andromeda as a human sacrifice only to be thwarted at the last minute by Perseus and his Pegasus. As corny as it may look by today’s standards, that Kraken was the coolest thing I’d ever seen at the time. 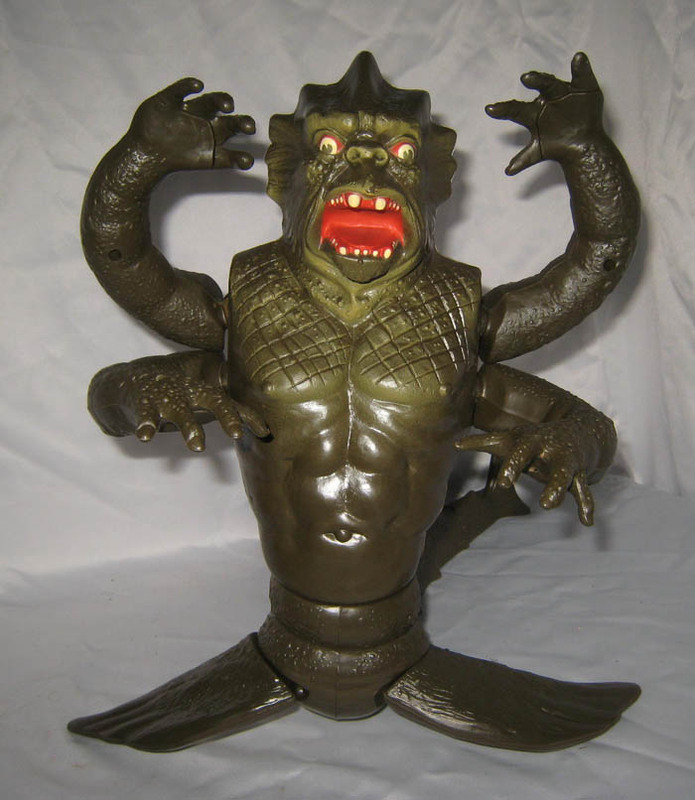 I desperately wanted the Kraken toy produced by Mattel in the 80s (still do) but the only Clash of the Titans figure I owned was Charon, the boat keeper on the River Styx. 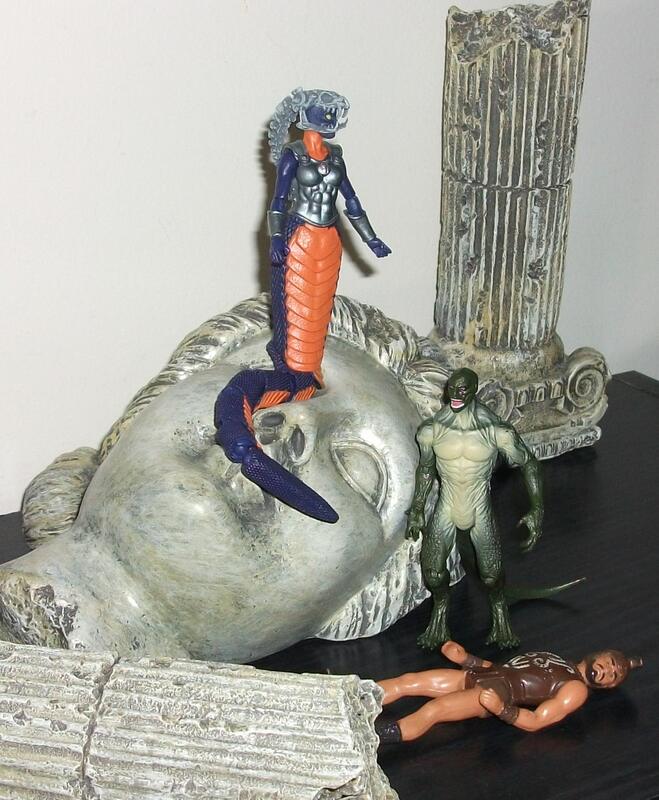 The second coolest creature featured in the movie, which did not got an action figure which is a real shame, was Medusa, the snake-haired Gorgon who could turn men to stone with a single glance. Medusa freaked me out when I was a kid. I still think the stop-motion version is way creepier than the 2010 version, partly because she was so ugly whereas the updated CG Medusa was designed to be attractive. 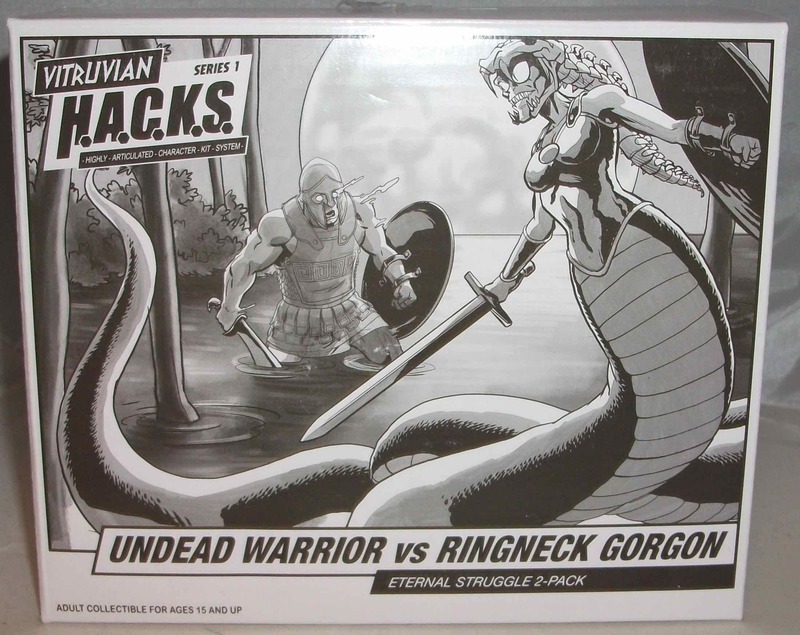 I also love the movie “300″as much as the next guy but when BFS launched their Vitruvian Hacks Kickstarter campaign it wasn’t the Spartan Warriors that drew me in, it was the Gorgons. 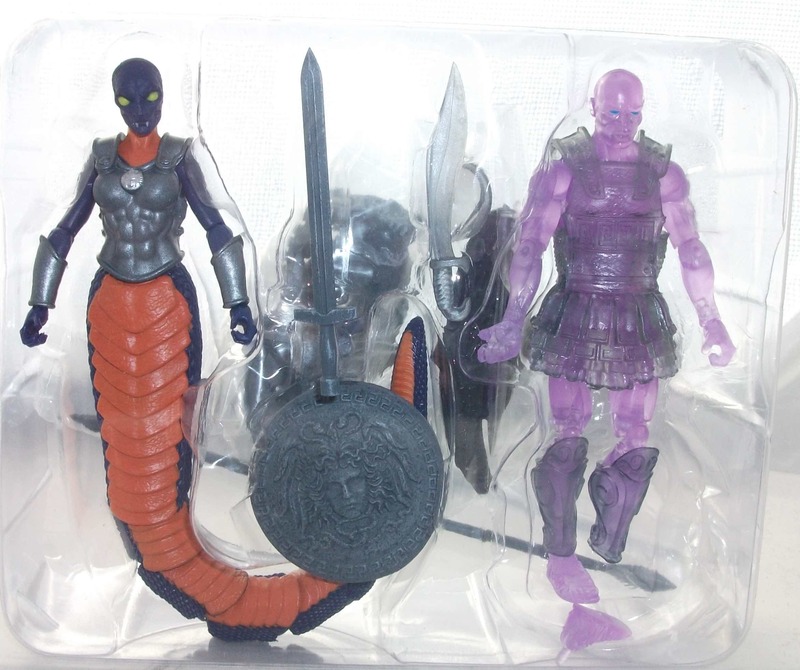 The main Gorgon figure in the Hacks line is of course Medusa and from the images I’ve seen online she looks great, but I still have a while to wait before I’ll have her in my hands. 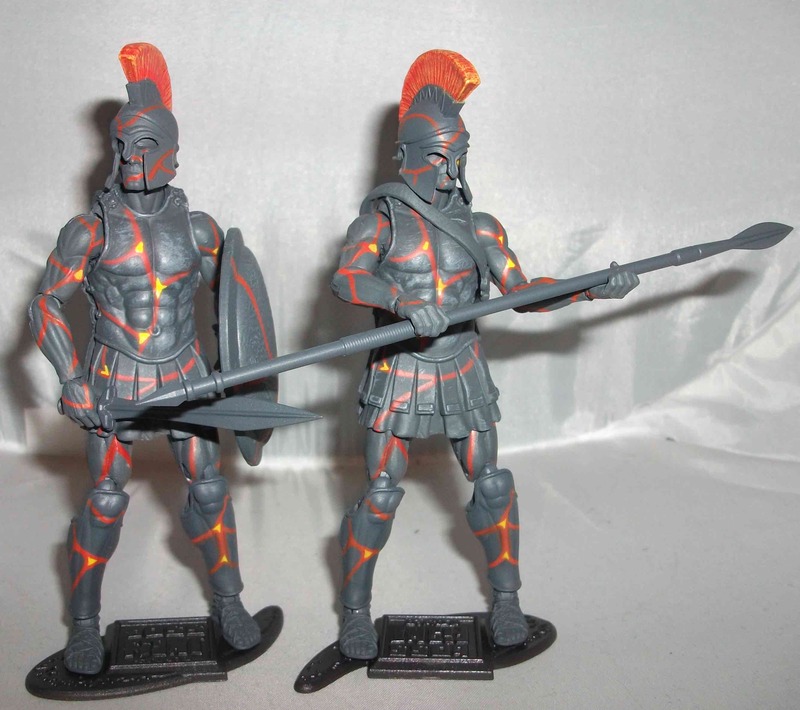 As the Kickstarter raised more and more funds BFS added more and more figures to the launch including Gorgon soldiers in a variety of colors. I was most looking forward to the all black one, Black Racer. 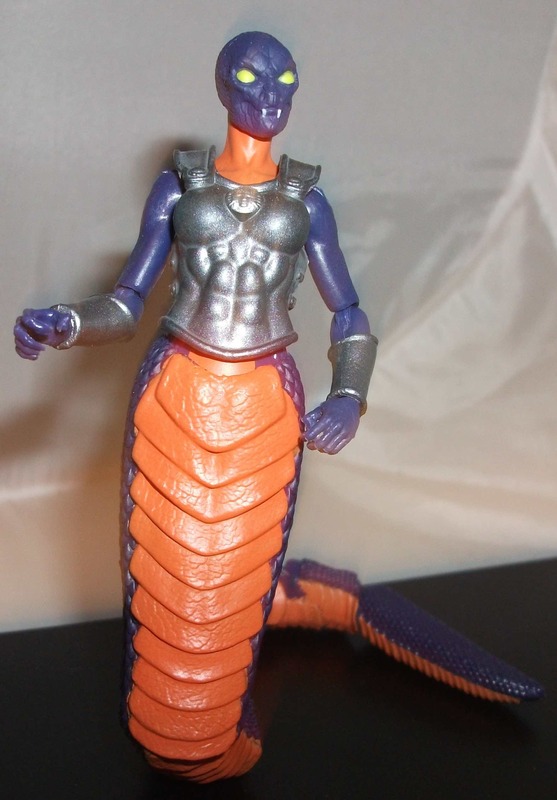 This purple Gorgon, the Ringneck, wasn’t part of the Kickstarter. She wasn’t revealed until a couple of months ago when BFS announced they’d be selling the Eternal Struggle 2-pack at Conventions this summer. It’s hard to say, since I don’t have the other color variations in hand yet, but I think the Ringneck may be my favorite Gorgon of the bunch. The green and the orange ones look a little too bright and the black one is maybe a little too dark. The Ringneck is a happy medium. The shade of purple selected is really nice and the orange used on the underside compliments it well making for a vibrant and visually appealing toy. I can’t say enough good things about the sculpting on this figure. The gang over at Boss Fight are true artists because this thing is beautiful. There are teeny scales all over the body and the face is great. Those big soulless yellow eyes would put the fear into any Spartan I’m sure. The design of this figure also needs to be praised. The Undead Warrior is the perfect action figure representation of a human in this scale but the Gorgons take it to a whole other level. The twisty snake tail looks and feels really cool. It’s constructed using individual segments, sort of like the tails seen on Godzilla and Otachi. 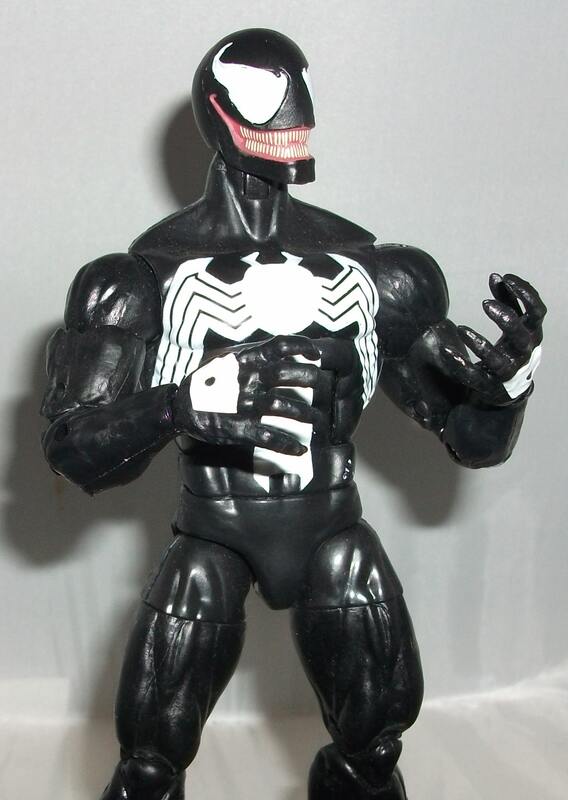 It has a cool rubbery skin and can be posed all kinds of ways. Most impressively, it allows the character to stand upright which is awesome. 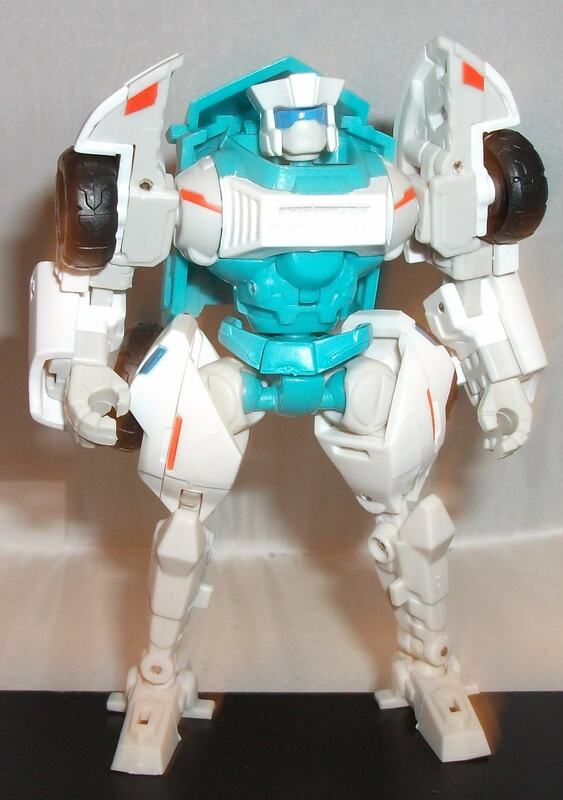 This is leaps and bounds beyond the rubber tail Hasbro gave us on Golobulus back in ’87. For accessories The Ringneck has removable chest armor, a spear, a sword, a very cool shield with an intricate crest, and a totally awesome helmet made out of the skull and spine of some poor creature. At a glance you could say the accessories are all just grey but upon closer inspection you’ll see they’re all different. The shield and sword look they could be made of stone, the armour is metallic, and the helmet looks like bone. It’s all very impressive. This figure is truly boss. 10 out of 10. Two years ago I backed a Kickstarter campaign launched by Boss Fight Studio (BFS) to help them produce a line of customizable action figures called Vitruvian H.A.C.K.S. (Highly Articulated Character Kit System). The campaign was successfully funded (and then some) but that’s when the waiting game began. BFS ran into some troubles along the way but they were always good about keeping their Kickstarter backers informed of their progress. In February BFS told us that the first six figures had arrived at their warehouse in the USA from the factory in China. To compensate for the delays, BFS said they’d ship out those six figures immediately at their own expense rather than wait for the entire orders to be filled. 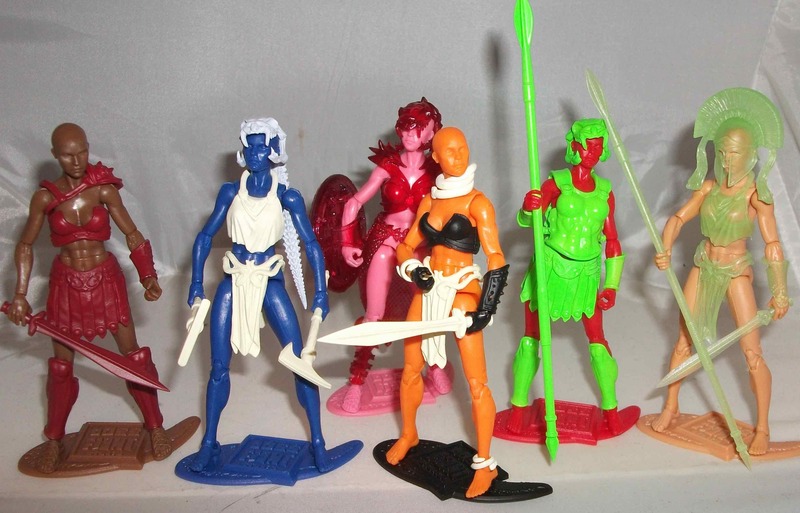 At that point I knew I was mere weeks away from owning my first Vitruvian Hacks figures. I wrote a blog post about their pending arrival proclaiming that reviews would soon follow. It turns out I jumped the gun. “We are contacting you because your shipment is going to an international address. At this point we have managed to get a lot of orders shipped and sent out. Our next priority is for backers that live outside of the US. Due to price hikes in international shipping we have decided to give you the following options before we proceed. -The first option is to pack and ship two packages to you, the first package will consist of the items that we have on hand at this point and the second will consist of the additional items that make up your backer level. So I had a choice to make, have them send me six figures now or wait even longer (months perhaps) and accept a free figure for my trouble. I concluded that I’d already waited two years so what’s a couple more months. I was helping BFS out and I would be repaid for my kindness by way of an extra Underworld Warrior. I was mostly cool with it but it was disappointing none-the-less because I’ve been dying to get my hands on these figures. However, a dash of good news came shortly afterwards. BFS was scheduled to appear at a Convention somewhere the weekend of April 2-3. At the con they’d be selling an exclusive two-pack of figures that was not included in their Kickstarter campaign. Thankfully, they also made the pair available to non-attendees by offering them for sale on their website for 24 hours. I placed my order and after a 2-week wait finally received a ship notification April 15. And now, 2 weeks later, I finally have my first Vitruvian Hacks in hand. I was praying they didn’t disappoint because I’m expecting another 50 of these things to show up when my Kickstarter order is filled. So, did they live up to the hype? In a word, yes, but I will admit that opening the teeny box that the two figures arrived in was a little anti-climactic considering that for two years I’ve been anticipating the arrival of a massive crate full of individually carded figures. However, as underwhelming as the size of the box was the packaging was still pretty neat in its own right. When Hades needs warriors to defend his realm or to serve his goals in the land of the living, he simply plucks a fallen warrior from the river Styx and sends them out to do his bidding. These warriors are single-minded, doing anything to achieve their mission. they are nearly impossible to best in battle. How do you slay something that is already dead? I really appreciate that BFS went to the trouble of crafting back stories for these characters. They could have easily omitted that detail but I really think it adds some life to these characters. If I had read that blurb as a kid my imagination would have started firing on all cylinders as I dreamed up adventures this Undead Warrior of Hades could undertake. The figure itself is excellent. It’s similar in construction to other 3 ¾” figures like G.I. Joes and Marvel Universe so it’s completely compatible for play or display but it doesn’t suffer from any of the issues that often plague those other brands. The proportions are realistic, the sculpting is excellent with lots of subtle musculature, and the range of movement is fantastic. 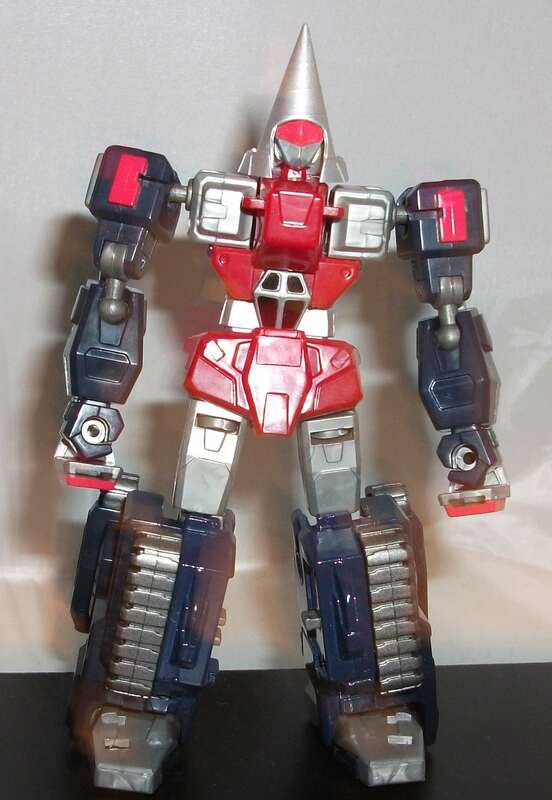 This figure can kick and sit down and raise his arms and do all kinds of things that many G.I. Joes simply can’t. BFS may very well have perfected the 3 ¾ figure here. Since this figure is basically a ghost he’s sculpted in translucent plastic and he doesn’t feature any paint apps save for his eerie blue eyes. The violet plastic they used for the body looks really nice especially in front of a light source which gives him an otherworldly glow. 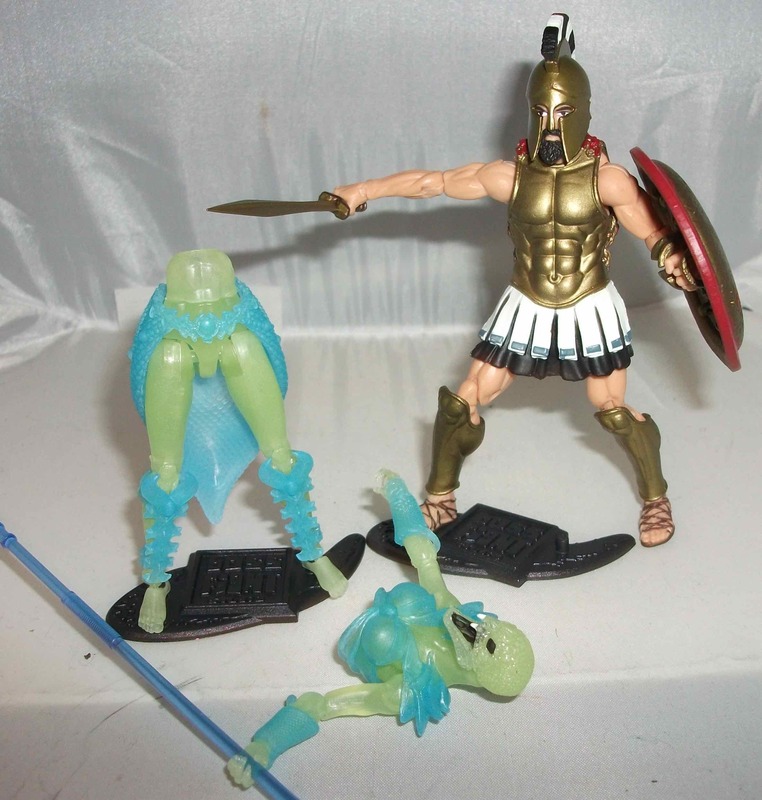 For accessories the Undead Warrior comes with a tunic, a helmet, a spear, two swords, and a display base. 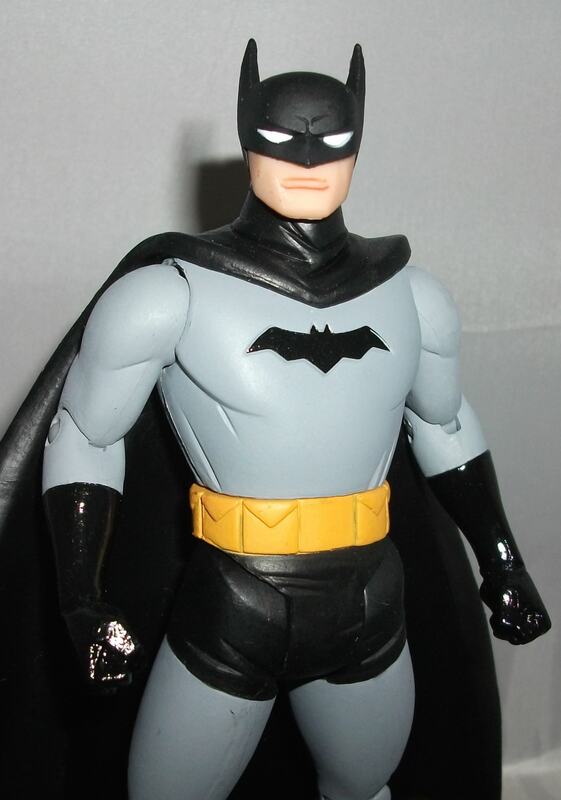 With the exception of the black base, all of the accessories are molded in translucent gray plastic and they don’t feature any paint apps either. I’m fine with the fact that there are essentially no painted parts on this figure and his gear because it adds to his ghostly appearance and I know there will be plenty of paints apps on the upcoming “living” warrior figures. 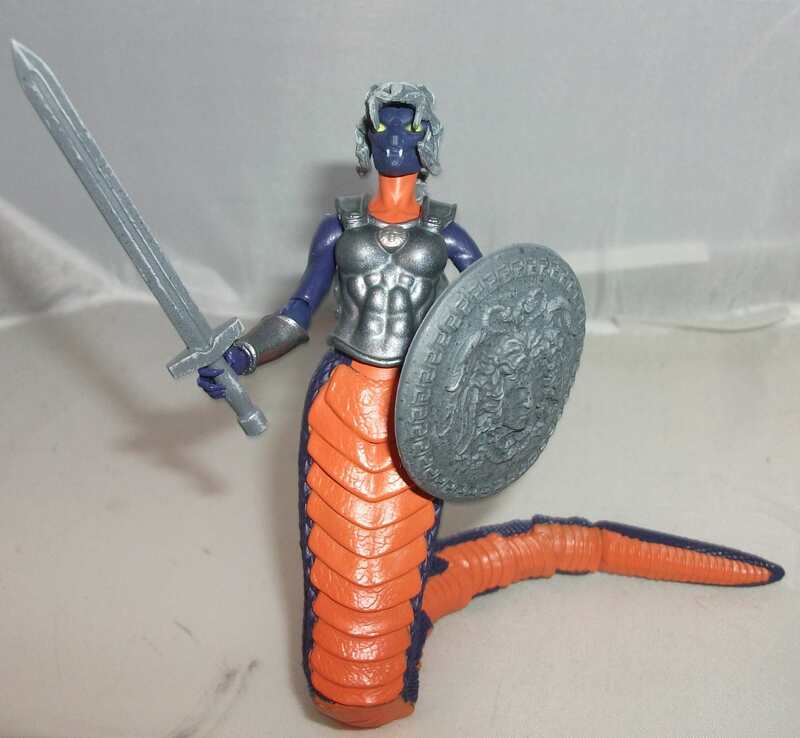 The last thing I want to mention before moving onto my review of the Ringneck Gorgon is the quality of the plastic used on this figure and his accessories. It feels like BFS has crafted the perfect formula; not too hard and not too soft. I don’t get the impression that this figure will break easily. It feels study yet flexible and I think it could withstand some serious play time. It’s a real shame that kids will likely never know about these figures. 10 out of 10.